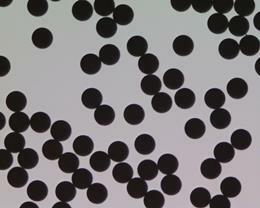 microParticles GmbH offers monodisperse spherical research particles based on various organic and inorganic polymers. The matrix chemistry of the particles ranges from melamine resins (MF), polystyrene (PS), polydivinylbenzene (PDVB), polymethyl methacrylate (PMMA), through poly(styrene-co-divinylbenzene) and poly(styrene-co-methacrylic acid methylester) copolymers to silica (Si02). The product palette covers beads of mean diameters from 0.1 up to 1000 µm in more than 200 different sizes. Characterized by their outstanding quality (typical C.V. values ≤3 %), our research grade particles are the best choice at economic prices. Due to the different polymer compositions, the physical and chemical properties of the various types of particles are distinct from each other, which makes them suited for a whole spectrum of purposes. The high quality of our research grade particles and their versatility are illustrated with numerous successful applications in research and industry. We therefore feel obliged to continuously extend our product palette. -> Ask for other particle diameters and pack sizes or for specifically adjusted polymer densities. Particle size standards are being used in industrial, pharmaceutical, clinical, and scientific laboratories for many purposes. Among others is the calibration of various measuring instruments such as flow cytometers, laser diffraction devices, analytical disc centrifuges, or cell and particle counters. 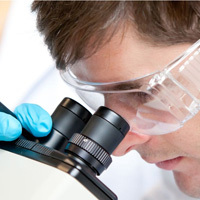 Moreover, they allow for the traceability of measurement results, the development and validation of measuring techniques, and for the assessment of measurement uncertainties. Also, they are applied in the field of quality control and for the calibration and testing of filter materials. 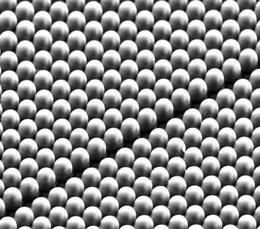 For these applications, microParticles GmbH offers its customers particle size standards of highest quality over a wide diameter range from 100 nm through approximately 1000 µm. 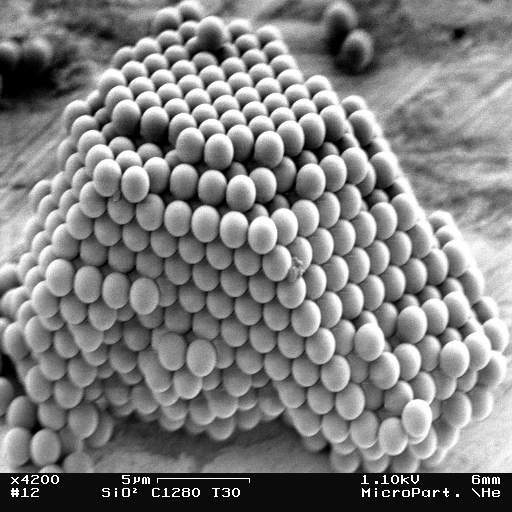 They consist of polystyrene or poly(styrene-co-divinylbenzene) and are characterized by combining different methods like transmission electron microscopy (TEM), scanning electron microscopy (SEM), differential sedimentation (high resolution disc centrifuge DC 24000), optical microscopy, and electrical sensing zone method (Coulter Multisizer™ 3 and 4). Traceable to primary reference materials of the National Institute of Standards and Technology (NIST/USA) and European Institute for Reference Materials and Measurements (IRMM/Belgium). CV < 2 % for the majority of the products. In order to guarantee high colloidal stability, the aqueous particle suspensions contain surfactants and antimicrobial agents. Every particle size comes with a certificate that documents important information like certified mean diameter, standard deviation, CV-value, size distribution graph, solids content of the suspension, particle number per ml, material density, refractive index, and other. 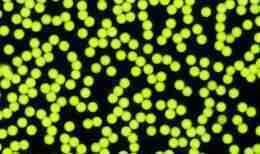 In comparison to PS-based particles, the fluorescently-labelled MF microspheres have the additional advantage that they are dispersible in common organic solvents and oils without any dye-leaching, swelling, or shrinking. 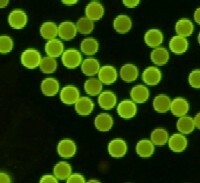 The fluorescent particles of microParticles GmbH are used for flow measurements in gases and liquids like Laser Doppler Anemometry (LDA), Particle Dynamics Analysis (PDA), and Particle Image Velocimetry (PIV), filter testing, in the field of non-destructive testing of complex aircraft, railway, and automotive components, in medical research (phagocytosis testing, blood-flow measurements, imaging), or as tracers in environmental science. 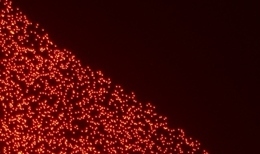 Recently, microParticles GmbH developed PS-based fluorescent particles for calibration purposes in flow cytometry as well as mulifluorescent particles, dyed with up to five different fluorochromes in one particle (MF- and PS-based). -> Inquiries for other dyes or special multicolor preparations are welcome. 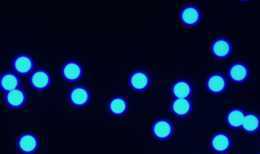 led to the linkage of a variety of functional groups to the surface of particles, made from different materials. The adjacent figure illustrates available functionalities. Particular emphasis is placed on carboxylated polymer beads, especially on melamine resin basis. With loadings of up to 1000 µmole COOH/g, these particles show excellent monodispersity, high mechanical strength and chemical resistance, low non-specific protein adsorption, and good colloidal stability over a wide range of pH values and electrolyte concentrations. Mercapto- and amino-functionalized particles also belong to our product spectrum. Upon request, modification with sulfonic acid, maleimid, epoxy, or hydroxyl groups is possible. -> Inquiries for other materials and diameters, than listed in the product tables are welcome. 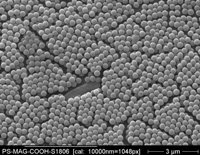 Monodisperse metal-coated microspheres have found wide applications in the fields of catalysis, anisotropically conductive adhesives (ACAs), microelectronics, Surface Enhanced Raman Scattering (SERS), Particle Image Velocimetry (PIV), and bioassays. 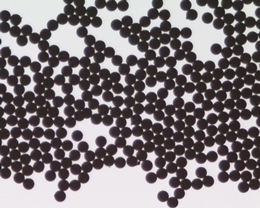 During recent years, scientists at microParticles GmbH have successfully developed strategies to metallize chemically different microspheres like melamine resins, polystyrene, polystyrene-divinylbenzene copolymers, poly(methyl methacrylate) copolymers, or silica. 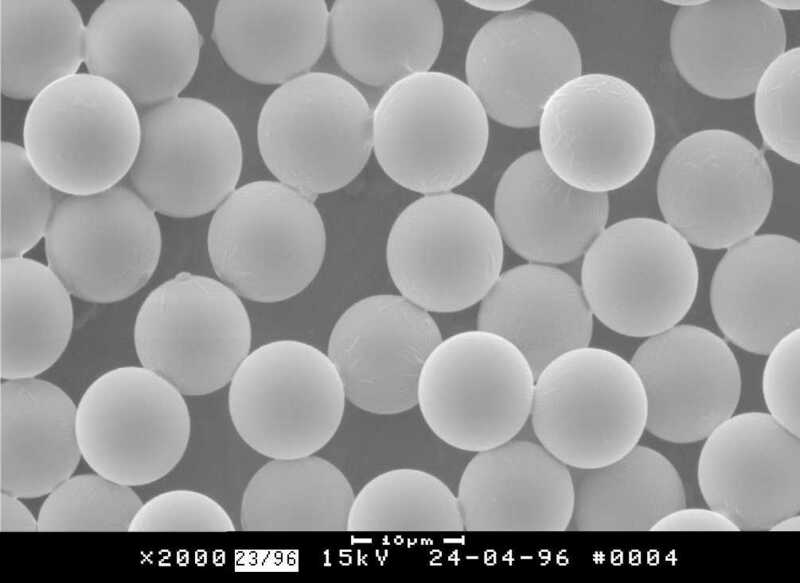 The composite microspheres consist of a monodisperse polymer core whereas the shell either consists of metal nanoparticles or a thin metal film of e.g. gold, silver, copper, or others. 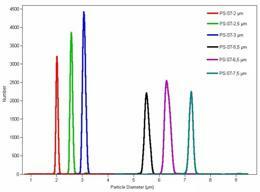 in particular, the AuCl4- adsorbance on MF microparticles of about 500 nm diameter reaches a very high value of about 0,5 g/g. 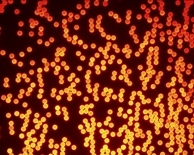 In the self-assembly approach, preformed colloidal nanoparticles are adsorbed on the specifically modified particle surface by electrostatic interactions, for instance. 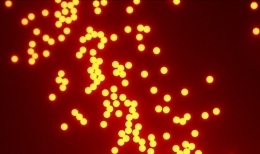 The extent of nanoparticle surface coverage can be controlled by varying the pH value of the solution, the immersion time, the metal colloid concentration in suspension, nanoparticle dimensions, and the chemical surface properties of the polymer particles. In this way, monodisperse microspheres with individually dispersed nanoparticles of gold, silver, platinum, or palladium can be prepared. In-situ synthesis approach: In the in-situ approach AuCl4-, PdCl42-, PtCl62- precursor ions are bound on the surface of chemically modified monodisperse particles by complexation and/or electrostatic interactions, followed by their in situ reduction to nanosized metal particles. 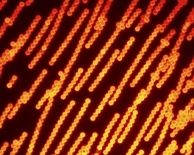 TEM images show the in situ synthesized metal nanoparticles being homogeneously distributed on the particle surface without aggregation. The average diameter is around 2-3 nm with a narrow size distribution. Narrow size distribution (CV <5%) and absolutely spherical shape. The iron oxide content can be adjusted in a wide range up to 50 wt.-%. The special surface coating minimizes aggregation in aqueous suspension and non-specific binding of proteins and nucleic acids. 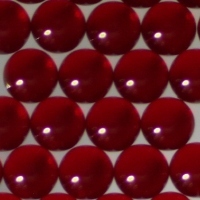 In addition to plain magnetic particles (PS-MAG and SiO2-MAG) and magnetic particles with COOH-modification (PS-MAG-COOH and SiO2-MAG-COOH), we also supply magnetic beads with streptavidin coatings (PS-MAG-SA and SiO2-MAG-SA). 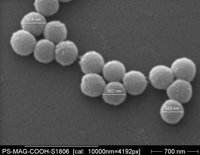 Moreover, microParticles GmbH offers the custom made covalent coupling of other proteins (protein A, hIgG, trypsin, BSA, ...) to carboxylated superparamagnetic particles. 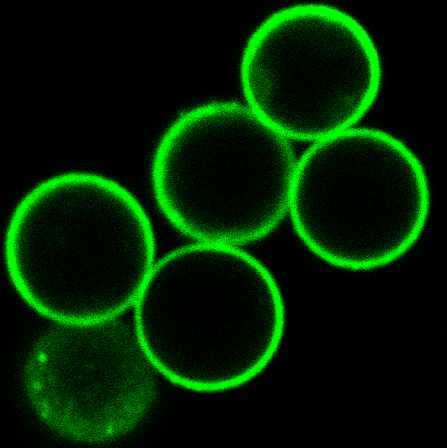 Upon request, we also manufacture superparamagnetic particles with reduced autofluorescence which are suitable for flow-cytometry. -> Other modifications (proteins, oligonucleotides) and particle diameters than listed in the tables upon request. 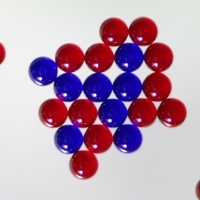 Narrow size distribution (C.V. < 5 %) and absolutely spherical shape. Excellent dispersibility in aqueous systems (pH > 7). High fluorescence intensity with various fluorophores. 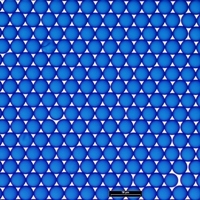 High reactivity of the COOH groups at the particle surfaces. -> Surface modifications or other colors and particle diameters than listed in the table upon request. Size range from 500 nm to 1000 µm. Narrow size distribution (CV < 3%). 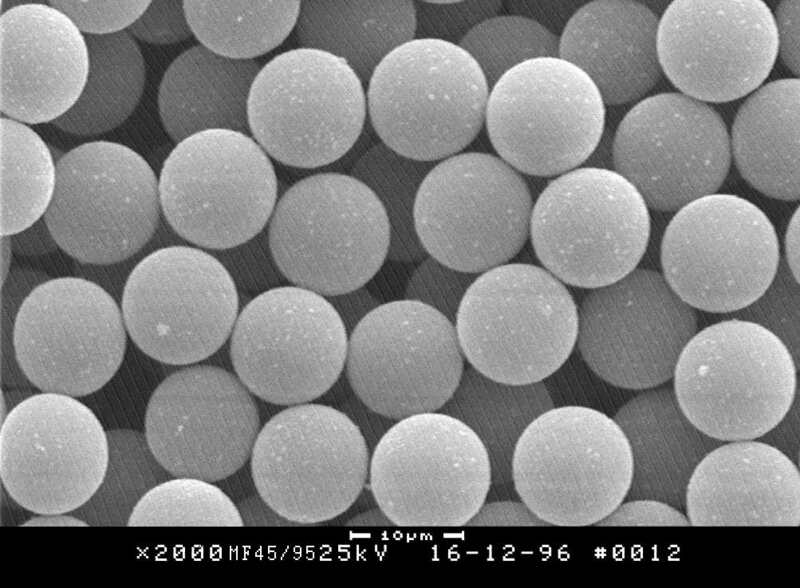 Spherical particles with smooth surface. 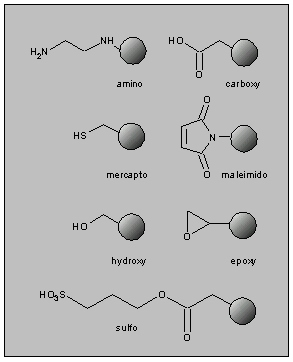 Surface functionalities (carboxyl, amino, and epoxy groups) available on request. Technical support and assistance in all particle-related respects.